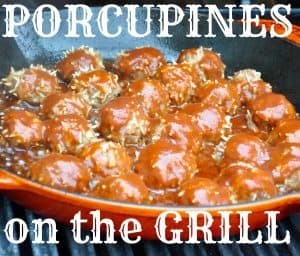 Obviously, I hope you know Porcupine Meatballs on the Grill mean the type of meatball, NOT actual porcupine. I don’t know if I’d be brave enough to eat porcupine if it was offered to me but I’m sure people actually eat porcupine. Right? Does anyone want to chime in? I’d sure hate to clean it if I had to eat it though. A quick google search leads me to believe people do eat porcupine, so there you go. Ah man, I finally got a new grill last month, it had been a long time coming, and we just bit the bullet and decided to buy one. It wasn’t an easy choice though because we’re traveling this fall you know, and every time we think about a big purchase I chime in with “well you know I’d rather have ______ in Paris or a cruise along the Greek coast” and that kinda kills the idea. I don’t mean to be a buzz kill I just want to go and have the trip of our dreams and not worry anything. But the grill was deemed necessary because it keeps the house so much cooler if I don’t cook inside on the days it’s in the 80˚s and yeah it’s been doing that a LOT lately. Added heat when you don’t have air conditioning is a no go. So I cook pretty much everything on the grill. “I CAN GRILL THAT” is my new battle cry, can anyone relate? Porcupine Meatballs on the Grill, obviously, I hope you know I mean the type of meatball, NOT actual porcupine. I don't know if I'd be brave enough to eat porcupine if it was offered to me but I'm sure people actually eat porcupine. 3/4 cup BBQ Sauce use whatever kind you prefer! 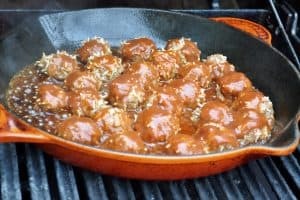 You will need a heavy duty cast iron skillet to make these on the grill--I used a Le Creuset but would rather use just a plain black one but I don't own one! What about you? What’s your favorite grilling out recipe? Old family stand by? NEW family standby? I need to know because I must grill everything all summer long. Would you mind pinning and sharing this post? It’s one of the many ways bloggers keep the lights on and I like lights in the winter. So, share, please?!? I’m pretty sure I saw Tony Bourdain eat porcupine on TV way back when…These porcupines are more to my liking though! I have yet to cook with my cast iron on the grill, but Imma have to try it now! and I think I may have seen that episode Rachel–was he in Cambodia?? yeah and the lady said it was “squeezle” which cracked me up! HA! How do they cook it in your book Wendy?! Yumm!! Those sound saucy and delicious! Thanks Rebekah! They are SO yummy! 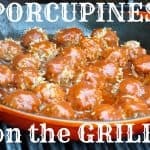 I’ve never made porcupine meatballs, but they sound delicious! I’ll be trying out your recipe soon! pretty much an Alaskan staple-made with moose when I was a kid-we love them although it took my kids a little convincing that they weren’t actual porcupine meat!! These look great Laura! I’ll have to give them a try very soon. I stumbled and tweeted them. Is the rice cooked or not when added? Thx! No the rice is raw, it cooks in the meatballs!